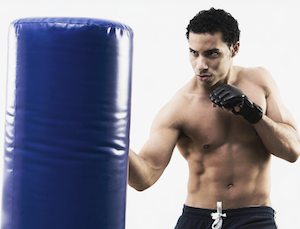 Heavy bags are very dynamic tools for martial arts training. They can be used in numerous exercises and drills and below are 8 exciting drills you can implement in your training regimen. The heavy bag drills fall into 3 distinct categories, including technical drills, power and speed drills, and endurance drills. Read below to get specific and actionable training suggestions for each drill. 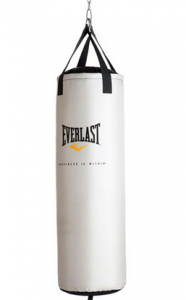 If you need a heavy bag for training, we have an excellent interactive chart and reviews of some very popular heavy bags. 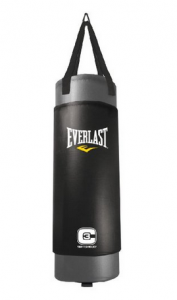 Learn more at our interactive heavy bag guide. 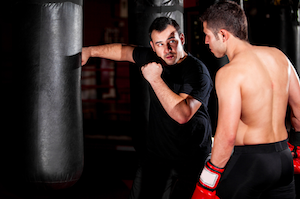 Technical drills are designed to help fighters develop their fighting skills. These skills include basic technique, accuracy, timing, and footwork. Have a training partner hold the bag steady for you and count off your set. Simply focus on a specific technique and repeat it over and over, in order to reinforce it in your mind. Stand directly in front of the bag and don’t worry about moving your feet. Stay grounded and deliver your shots directly to the bag in sets of 10 or 20, before moving on to the next technique. Ex. 10 jabs, 10 crosses, 10 lead hooks, 10 rear hooks, etc. The focus here is not power or speed, rather proper form. Do not rush; focus on the technique. 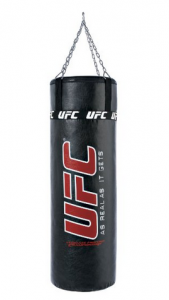 Put some duct tape at various points around the heavy bag and try to aim for the tape. The better you get at this, the more challenging you can make it for yourself. You can start out with a partner holding the bag and use pre-determined techniques or combinations to start. Then you can move to a freestyle round in which you can throw what you want. This will help you develop your accuracy on a moving target. Work your timing on a punching bag by getting the bag to swing, either by pushing it or getting a partner to swing it for you, and then try to time it so you hit the bag as it swings back to you. The challenge is to hit the bag at the right moment, not over extending or smothering your technique. This works well for kicks, like push kicks or side kicks, as well as punches (although we would suggest a lighter bag for timing punches). Using a lighter heavy bag that can swing freely, try to keep a consistent distance in front of the bag as it swings. You do not have to hit the bag at full power, rather keep your power at a level where you can keep your stance and still move around the bag without tripping yourself up. Increase the difficulty by trying to keep a specific point on the bag in front of you at all times. Developing power is one of the primary uses for a heavy bag. Speed is more difficult to develop, but a punching bag can be useful for this as well. The benefit of training with a punching bag instead of a human being is that you can hit it as hard and fast as you can and it will never get hurt, complain or get upset. Most power drills involve slowing down the pace of your punching bag routine and focusing on delivering as much force as possible in each shot. Start in sets of 10 and stand at the optimal range for your shots without too much footwork movement. You will want to work on going from a steady state to exploding into the bag with your strikes. This drill will work with multiple techniques. It can be done with straight punches, hooks, and even kicks and knees. Take a break in between sets so that you have time to recover your energy. This is not a drill that you want to do constantly until you burn out, as your body will get used to throwing softer and softer as you fatigue. The focus here is consistently hitting as hard as you can. An alternative to working in numbered sets is working in shortened free style rounds (60-90 seconds) with emphasis on maximum power. Speed is difficult to develop on a heavy bag. It is important to make sure that you do not sacrifice your technique in order to gain speed. A good drill is to pull your power back to about 60-80%, stand slightly out of range of the bag, and practice springing in and hitting the bag with a quick combination of 3-4 punches and then springing back out of range. Focusing on speed involves relaxing and snapping your shots out as quick as you can. Take a short rest in between each combination to recover your speed. Similar to power drills, this type of hand speed drill should not be done as a burnout set, as your body will get used to throwing slower and slower as you fatigue. Work in sets of 10 to begin with, and then increase when your endurance allows you to. Hit the bag with a basic short combination (i.e. 1-2 punches) as hard and fast as you can for 30 seconds. Then take an active 30-60 second rest (i.e. jogging on the spot) back to the bag as hard as you can for 30 seconds,. Then substitute a different exercise for 30-60 seconds. Do this for 3 repetitions and then take a longer break. If the interval training drill takes too much energy to begin with, then try to substitute the active period with less strenuous exercises. 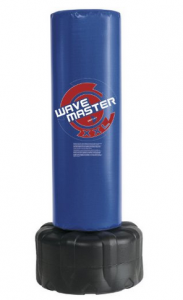 Hit the bag in normal freestyle mode for 30 seconds. Then hit the bag as hard as you can non-stop for 30 seconds. Then hit the bag with continuous 1-2s as fast as you can for 30 seconds. Repeat this a couple of times to begin with and then increase it to more repetitions as your conditioning improves. If you start implementing some of these drills into your workout you will begin to develop you speed, power, endurance and technique. 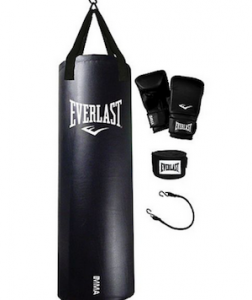 Make sure to read the reviews and visit our homepage to get all the details on the best punching bags. You can also see a few more drills here. 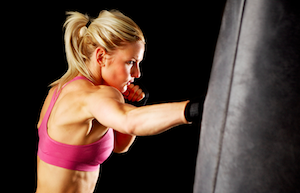 If you are new to heavy bag training, make sure to read our how to use a heavy bag guide.